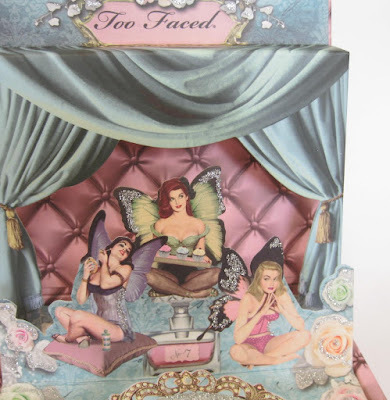 A few days ago, I did a post on the Too Faced Vintage Sale. 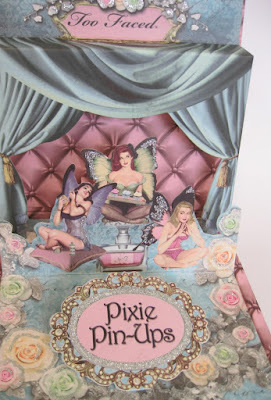 In it, I posted the Pixie Pin-Ups Palette, which is now on sale for only 15 bucks! 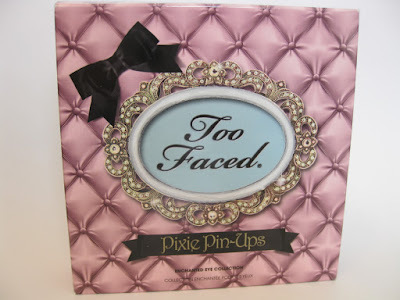 I bought the Too Faced Pixie Pin-Ups Set back back in (I believe) January. It was on sale for $25 (from $32) so I quickly snapped it up meaning to give it as part of a gift. However, after sitting around in my room, I had to check it out for myself. 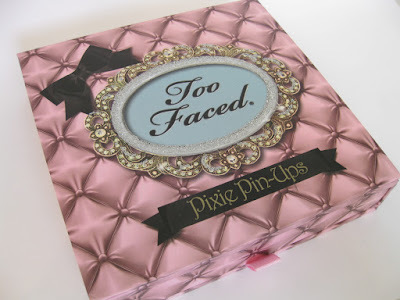 The Packaging: The boxy palette is like a mini version of Too Faced Enchanted Glamourland or Urban Decay Book of Shadows. The top opens to reveal a pretty pop-up fairy scene while the drawer underneath holds the eyeshadows and slots for the Shadow Insurance, Lash Injection Pinpoint Mascara, and Lava Gloss Eye Liner. The packaging is a bit bulky. I'd prefer a slimmer palette without the adorable pop-ups. The Product: The six eyeshadows are all very pretty. The three shimmery shades (Leading Lady, I Know What Boys Want, Lucky Charms) on the top row all have a softness to them that really fits into the fairy theme. The two matte shades from the bottom row (Heaven, Like A Virgin) are a nice addition to the palette because sometimes too much shimmer can be too over the top. Erotica, my favorite shade (third shade from bottom row), is a beautiful, darker shimmery shade. One strange thing that I should mention is that Lucky Charms in this palette is very different from Lucky Charms in the Eye Shadow Insurance Policy High Demand Eye Shadow Collection palette, which I used to own. The Lucky Charms shade in that palette is darker and more of a true green. I find it puzzling as to why Too Faced wouldn't be consistent with their shades. I wanted to love the Lava Gloss Eye Liner because of its rich, glossy color but it was extremely unkind to my eyes. I wouldn't say my eyes are sensitive as this rarely happens but when I applied the liner to my upper lash line and lower lash line and waterline, my eyes started to burn and water. I tried to endure it for a few minutes hoping the burning would go away but it wouldn't wear off. Because of this, I had to wash it off so I have no idea how long the liner lasts. I have tiny lashes to begin with and the Lash Injection Pinpoint Mascara made them a bit longer but did nothing when it came to making my lashes look thicker and fuller. I got some good volume out of it though -I think it's a good enough mascara but I wouldn't splurge on this. As for the Shadow Insurance primer, it's one of my favorites. Click here for the review. Overall: I think this is a lovely palette. 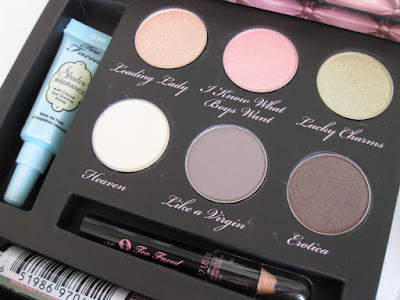 The eyeshadow shades are all very pretty, the primer is great, the mascara is decent, and the eyeliner will be great for lining -if it doesn't burn your eyes like it did mine! =O However, I personally already have shades that are similar to these (with the exception of gorgeous Erotica) and already own Shadow Insurance so I passed it on. ahh it's sold out now! Why must you make me want things? @ yourstrulypam.. $15 is the price at the Too Faced website. At Sephora, it's going for $25 if they have any left at your store -it's sold out online. Hope that helps! @ PoorCollegeStudent.. Oh no! I could've sworn it was in stock yesterday when I wrote this post. =( Sorry. Maybe you can get it at your Sephora store but it'll be $25 there. Sometimes they have random items in the drawers below the displays. @ MEOW.. Yupp! Very pretty. that looks pretty!! I am loving the colors, really. something i'd personally use!